How revolutionary is the iPhone 5S going to be. Is it set to take the world of mobile computing by storm, or will it simply make a blip. Here are the tall claims of the Apple staff while they unveiled the App iPhone 5S and the iPhone 5C today. The claim: – The 5S is the most forward thinking of our devices; in fact, it might be the most forward-thinking device ever”. Is it really so, let us examine the feature announcements one by one. Processor: The iPhone 5S will come with the A7 processor. A7 is a 64-bit processor, the world’s first and only such CPU in a smartphone. Operating System: iOS 7 – to be unvieled and made available to all iPhones starting iPhone 4 and iPad 2. The iOS 7 is also built for the 64 bit. So, does it not defeat the purpose, how fast will it run on the other devices that do not have a 64 bit processor? This needs to be examined and tested. Extra chip for motion sensing: iPhone 5S will also come with an inbuilt chip for motion processing. The new Chip – M7 will perform the tasks of continuously measuring motion data, accelerometer, and gestural data. Apple sees this opening a “whole new generation of health and fitness applications”. It can identify user movement, determining whether you’re walking or driving. – Apple has collaborated with Nike to come up with some health related usage for the motion sensor chip. Is this not old news? Already the market has seen some other smart phones that ship with an extra chip for motion sensing -the recently announced Moto X has separate motion sensor chips. Security: Enhanced biometric Security – Finger print reader. Touch ID – reads your fingerprint at an incredibly detailed level. The Touch ID fingerprint sensor is capacitive, 170 microns thin, has a 500 ppi resolution, scans sub-epidermal skin layers, and has 360 degree readability (no matter how you train the sensor to read your finger, it can read it from any rotation).Apple claims that they are the first to bring in this feature in a smart phone and they are wrong. What is new in this? you can simply touch the home button to unlock your phone. Since it’s built in, you can also use it to make iTunes purchases [without typing your password]” Apple is not the first to bring in biometric security / finger print security on a smart phone. Motorola Atrix already launched this feature earlier this year. Toshiba phones too had this feature way back in 2007/08. Enhanced camera functions – An 8 megapixel camera with advance features is what Apple has on offer for the iPhone 5S. The camera has a larger, f/2.2 aperture. It’s got a new, 15% larger active sensor area”. Apple said, they believe that bigger pixels mean better pictures. Their sensor has 1.5 micron pixels. The camera flash in the iPhone 5S has two LEDs — one white, one amber. It analyzes the lighting in the room, adjusting the color of the flash accordingly. The phone has the ability to take slow motion videos – slow – mo that is. But, is that not a simple copy of features from somewhere else? Only this time, it was Motorola’s latest launch Moto X. Battery life: in the words of Apple, “it is even better than that of the iPhone 5”. Now, it is upto the users to judge if that is a true claim. The 64 bit processor must need some more juice out of the batter for sure. Plastic Make: The back is made from a hard-coated polycarbonate. Inside, it’s built with a new steel-inforced construction method. So, it is plastic outside with a steel frame inside. The entire back and sides are made from a single part, its front one glass, multi-touch surface. As close as you look, you wont see joints or seams”. The build quality of apple products is indeed better than the others. Processor: powered by an apple-designed A6 chip. Software: iOS 7 – available free from September 18th -it will support the iPhone 4 and later, ipad 2 and later, iPad Mini, and iPod Touch (5th Gen). All of these 5 apps have been made free and will come bundled with all new devices and will be downloadable freely for all devices. So, overall the new iPhone has not brought anything new to the market. They have only recycled features that were used earlier by competitors and have since been abandoned. 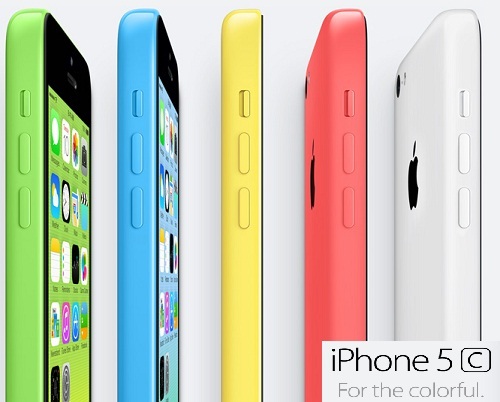 Again, looking at the cost announced for the iPhone 5C, does not seem to signal it to be really a low cost phone. Sources say, if bought without a subscription, it would most likely cost more than USD 500 that doesn’t make it a low cost phone from any angle for sure.